Lt. Gen. Nadja Y. 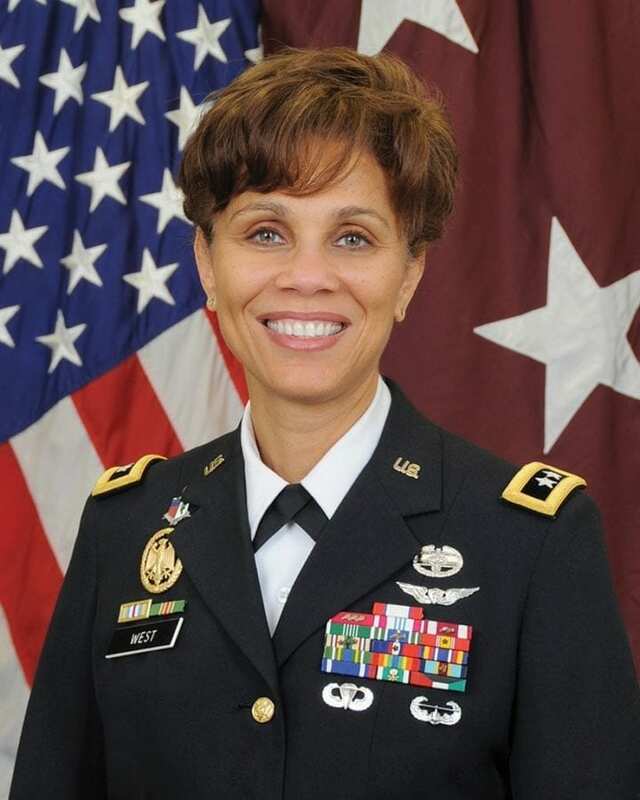 West is the 44th surgeon general of the U.S. Army and commanding general, U.S. Army Medical Command, and is a graduate of the U.S. Military Academy with a Bachelor of Science in engineering. She attended the George Washington University School of Medicine in Washington, D.C., where she earned a Doctor of Medicine. She completed her internship and residency in family medicine at Martin Army Hospital, Fort Benning, Georgia. During this assignment, she deployed with the 197th Infantry Brigade, 24th Infantry Division, during Operation Desert Shield and was attached to the 2/69th Armor Battalion during Operation Desert Storm. She then served at Blanchfield Army Hospital, Fort Campbell, Kentucky, as a staff family physician and then the officer in charge of the Aviation Medicine Clinic. While there she also participated in a medical mission with the 5th Special Forces Group (Airborne). West completed a second residency in dermatology at Fitzsimons Army Medical Center and the University of Colorado Medical Center in Denver, and afterward was assigned as the chief, Dermatology Service at Heidelberg Army Hospital in Germany. In her following assignment, she served as the division surgeon of the 1st Armored Division, Bad Kreuznach, Germany, deploying to the former Yugoslav Republic of Macedonia and Kosovo as the deputy task force surgeon. She was then assigned as chief, Department of Medicine and the Dermatology Service at 121st General Hospital in Seoul, Republic of Korea. West then commanded McDonald Army Community Hospital, Fort Eustis, Virginia, and served as the deputy commander for integration at the National Naval Medical Center (NNMC), Bethesda, Maryland, where she became the first Army officer to join the leadership team at NNMC. She then served as the director of operations for Joint Task Force National Capital Region Medical. Following this assignment, West commanded Womack Army Medical Center, Fort Bragg, North Carolina, and went on to serve as the commanding general, Europe Regional Medical Command. Following her command in Europe, she served as deputy chief of staff, Office of the Surgeon General. She then moved into her most recent assignment as the Joint Chiefs of Staff surgeon at the Pentagon. As the Joint Chiefs’ surgeon, she served as the chief medical adviser to the chairman of the Joint Chiefs of Staff and coordinated on all issues related to health services, including operational medicine, force health protection, and readiness within the U.S. military. West completed the Army Medical Department Basic Officer and advanced courses and graduated from the Army Command and General Staff College. She is also a graduate of the National War College, earning a Master of Science in national security strategy. Her awards and decorations include the Distinguished Service Medal, the Legion of Merit with three Oak Leaf Clusters, the Defense Meritorious Service Medal, the Army Meritorious Service Medal with two Oak Leaf Clusters, the Army Commendation Medal, the Army Achievement Medal with two Oak Leaf Clusters, the NATO Medal, various campaign medals, the Combat Medical Badge, the Flight Surgeon Badge, the Army Parachutist Badge, the Army Air Assault Badge, and the German Armed Forces Proficiency Badge in Gold. Veterans Affairs & Military Medicine Outlook: You have 11 siblings. What life lessons did you learn from growing up in a large family? Lt. Gen. Nadja Y. West: Growing up in a large family, I learned a lot about sharing, teamwork, patience, and compromise. However, being the youngest and the favorite, I also learned what it meant to be protected and taken care of, but also the importance of speaking up and being heard. Why did you enlist, and why did you join the Army? I joined the Army because I had such a great experience being the daughter of a career Army officer and because of the example my father set for my brothers and sisters and I on the importance of service to country. Nine of my brothers and sisters went on to serve in the military, most in the Army, but one sister joined the Air Force and another sister joined the Navy. Again, being the youngest, I saw the pride and dedication as each one of them followed my father’s footsteps, and I could not wait for my turn to serve as well. You are the highest-ranking female graduate of the U.S. Military Academy at West Point. You now command the U.S. Army Medical Command, and you are the Army’s surgeon general. To what do you attribute your successes? There are so many factors that have contributed to my success that it would be difficult to describe them all, but a major factor is the phenomenal foundation established by my parents. Both were very hard-working people of tremendous faith who demonstrated selflessness and taught us kids the importance of being girls and boys of character and the importance of ensuring all of our actions were in keeping with the values we were taught and observed. Interestingly, they are almost the same ones that we identify as our Army values. To build upon that base, there have been many people along the way who have provided additional examples, mentored me, provided opportunities for me to excel, and encouraged me along the way. Most importantly, the teams of wonderful people I have had the privilege to work with and lead deserve maximum credit for any success that I may have enjoyed during my 35-plus-year career as a soldier. You’ve been in your post for almost three years. What has been the biggest challenge for you as commander of U.S. Army Medical Command? The greatest challenge is ensuring that my vision and intent is disseminated through every level of the organization given the scope, scale, geographic dispersion, and variety of the subordinate units that make up the 130,000-member Army Medical Department. Ensuring that each member of the team – comprised of soldiers, civilians, contractors, and volunteers; medics, doctors, nurses, dentists, veterinarians, dieticians, researchers, administrators, educators, and pilots, to name only a few, in over 120 medical occupational specialties – understands how he or she contributes to the overall mission of conserving the fighting force in an ever-changing environment is the greatest challenge. What advice would you give to a newly enlisted soldier? And what advice would you offer to a newly commissioned physician? The advice I would give to a new member of the Army team, both enlisted and officer, is to learn early not only what you do in your specific area of expertise, but what you are for in the big picture to support our Army. She or he must be proficient in their chosen profession, be it a radiology technician or an optometrist. They must also understand how practicing those specific specialties contributes to our Army’s No. 1 priority of readiness. I would tell him or her to never stop learning, to never forget to live by the Army values that must serve as the undercurrent for all you do, and to never take for granted that you have the privilege of serving in the finest organization on the planet: America’s Army. What is MEDCOM’s role in Total Force health readiness? Army Medicine enables the medical readiness of the Total Army. Soldiers come from cultures, communities, and environments that produce a variety of health and fitness outcomes. Unit commanders are responsible for soldier readiness, but rely on Army Medicine’s technical expertise and capabilities to prevent, identify, and treat health problems while optimizing the performance of healthy soldiers. Army Medicine enables medical readiness by: 1) developing Army policies and standards for expeditionary medical readiness; 2) advising commanders on the health readiness of their soldiers; 3) assisting commanders to identify and reduce environmental health threats; 4) developing knowledge and tools to positively modify physical performance and behavior; and 5) identifying and, when necessary, providing support to responsibly transition soldiers who are medically unqualified for continued military service. The medical readiness of the Total Army ensures that our nation can rapidly and reliably project ground combat power that will physically dominate in missions across the range of military operations. For each soldier or other service member who receives care, we view each one of these encounters as an opportunity to improve that individual’s health and improve their readiness or ability to do their military specialty. In a typical day, through its 32 military [medical] treatment facilities [MTFs], Army Medicine performs more than 50,000 outpatient clinic exams and more than 28,000 dental procedures, fills nearly 50,000 outpatient prescriptions, and performs more than 10,000 radiology procedures. We perform these services not only on Army soldiers, but also for sister service members in the Air Force, Navy, Marine Corps, and Coast Guard who receive health care at an Army MTF. Within the last two years, our medical readiness transformation [MRT] efforts have resulted in a dramatic increase in the total number of soldiers who are deployable and not limited by a medical condition. Through the directed efforts of access, quality, and command emphasis, Army Medicine continuously focuses on the health readiness of the Total Army. The fiscal year 2017 National Defense Authorization Act calls for transferring the administration and management of military MTFs to the Defense Health Agency (DHA). What are the advantages and disadvantages of migrating MTFs to DHA? There are several advantages of migrating the responsibility for the administration of all military MTFs to the DHA. First and foremost is the opportunity for the Army Medical Department to transform to better focus on its Title 10 functions to recruit, organize, train, and equip Army medical personnel in order to fully support the Army’s operational readiness requirements. Another advantage is the DHA will become the single point of accountability for the administration of all MTFs, which creates an opportunity for the Department of Defense [DOD] to standardize health care delivery and reduce variance among the service MTFs. I do not look at this transformation in terms of disadvantages, only new approaches on how to continue to improve and optimize the integration of DOD readiness functions with the health care delivery functions within the military MTFs to support the warfighter’s readiness. Army Medicine is working closely with the DHA, the Army, and the other services to help lead and to shape the way forward for the entire Joint Health Service Enterprise. You have talked about the success of Army Medicine’s approach to help reduce a soldier’s addiction to opioids or other pain medications. What are some of the pain management methods that are working in treating substance-use disorders? It is important to note that the incidence of opioid use disorder is considerably lower in the active-duty Army at 0.15 percent [fiscal year 2016 data], compared to 0.9 percent of the overall United States adult population. Additionally, opioid use peaked in the Army in 2012. Over the next four years, there was a reduction of more than 19 percent in the number of soldiers who were given one or more opioid prescriptions. 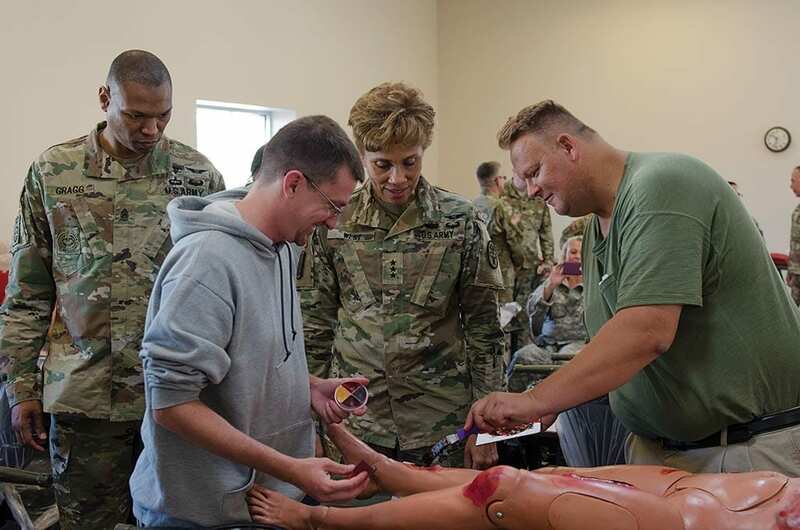 The Army Comprehensive Pain Management Program [CPMP] focuses on education, training, guidelines, and tools for providers and patients in order to accelerate the evolution of pain management practices to impact the national trend of over-reliance on opioid treatment of pain. Central to this initiative is the adoption and implementation of the Stepped Care Model for Pain. The model provides a standardized approach to pain care that emphasizes self-care and healthy lifestyle habits. Within the primary and secondary care levels, the model leverages primary care pain champions as well as internal behavioral health consultants and clinical pharmacists to assist providers in managing acute and chronic pain while minimizing the use of opioids. At the tertiary level of care, interdisciplinary management pain centers deliver holistic, multimodal pain management through the co-location of interventional, rehabilitative, and complementary and integrative health therapies. The combination of education and interdisciplinary care allows providers and patients to address pain with non-pharmacologic therapies such as physical therapy, acupuncture, movement therapy, biofeedback, and manual manipulation more, rather than reliance on opioids. To improve access, continuity, and quality for substance abuse treatment, Army Medicine recently integrated substance abuse clinical services within our behavioral health system of care. This allows us to address co-occurring mental and physical illnesses with effective and evidence-based early intervention and therapy, including the use of Medication-Assisted Treatment [MAT]. This approach brings substance use, behavioral health, and primary care providers together to form teams organized around the patient. All providers now use the electronic health record to share information and coordinate care. Teams can better identify early and address co-occurring behavioral health conditions and physical illnesses in patients who are at risk of developing substance use disorders, such as becoming addicted to prescription opioids. Substance Use Disorder [SUD] treatment integration has allowed Army Medicine to begin tracking patient risk and treatment outcomes targeted specifically for those with [an] SUD. Patient-reported assessments are collected as a part of routine care to inform clinical care, assist in multi-disciplinary planning, assess clinical progress throughout, and monitor treatment outcomes to include a decrease in addictive symptoms, such as physical cravings, and monitoring the potential for relapse. Could you talk briefly about the Medical Hands-free Unified Broadcast, or MEDHUB, technology that is being tested at Regional Health Command-Atlantic? The MEDHUB is a revolutionary capability increasing medical readiness through automated patient visibility. MEDHUB automatically collects and transmits patient data and estimated time of arrival, over the DOD tactical network in real time, from the ambulance to the hospital, allowing the facility to alert, rally, and prepare providers for incoming patients. Developed by the U.S. Army Medical Research and Materiel Command [USAMRMC], this hands-free, voice-free medical device automatically documents and transmits, thus enabling the medic to spend more time treating patients. The MEDHUB is being tested by the 44th Medical Brigade at Fort Bragg, informing medical providers at Womack Army Medical Center. The new Womack Emergency Room [ER] “Big Board” provides early and accurate trending vitals, drug doses, and mechanism of injury information to the staff, resulting in faster triage and seamless care upon reception. This developmental system is being designed for tactical evacuation units and hospitals supporting large-scale combat operations. Results from these tests and demonstrations will inform the final product decisions in FY 19. This program fills two gaps: providing accurate knowledge of incoming patients and providing accurate patient documentation prehospital for the patient’s electronic health records. In a July 10 press release, the Food and Drug Administration (FDA) stated it supports the Defense Department’s emergency use of freeze-dried plasma (FDP) to initially control hemorrhage from battlefield trauma. How will FDP usage affect frontline casualty care? Freeze-dried plasma is a medical combat multiplier for frontline casualty care, and United States Army Medical Research and Materiel Command is pursuing a two-pronged approach to provide freeze-dried plasma to the battlefield. FDP produced by a French military manufacturing facility is available to Special Operations Command under an Emergency Use Authorization [EUA] granted by the FDA on 10 July, filling the near-term gap for service members currently in harm’s way. To replace the French product, a commercially viable, U.S.-manufactured [Vascular Solutions Inc.] FDP is on schedule to be approved by the FDA in early calendar year 2019 for use where fresh-frozen plasma is unavailable [e.g., battlefield use], with full-use approval to follow upon completion of an additional clinical trial. The FDA’s decision will lead to the widespread availability of FDP, which is a significant step in addressing the leading cause of preventable battlefield deaths: uncontrolled bleeding. The FDA has granted a “priority review designation” for the new antimalarial drug tafenoquine. What is the significance of the drug? Tafenoquine [ARAKODA] was recently approved by the FDA on 8 Aug. It is the first new FDA-approved drug to prevent malaria in 20 years. Not only is it effective against all stages and species of malaria, but after a three-day loading dose, the drug only requires a weekly dose rather than a daily dose. No other FDA-approved anti-malarial drug can provide this protection, which is a substantial improvement over the current therapies and has the potential to contribute to malaria eradication. Availability of this drug will have significant impact on malaria worldwide. Also, could you talk briefly about the roles the USAMRMC and the Walter Reed Army Institute of Research played in attaining this determination? Tafenoquine [WR238,605] was first discovered and underwent pre-clinical testing in the Division of Experimental Therapeutics of the Walter Reed Army Institute of Research [WRAIR], a subordinate laboratory of the U.S. Army Medical Research and Materiel Command. Much of the clinical testing of the drug was conducted at or through WRAIR units outside of the continental U.S. Management of the advanced development of the drug to licensure was executed by the U.S. Army Medical Materiel Development Activity, another USAMRMC subordinate command, in partnership with 60 Degrees Pharmaceutical LLC., the ultimate sponsor and commercializer of the product. USAMRMC also played a significant role in assisting GlaxoSmithKline in achieving recent FDA approval of tafenoquine for the radical cure of Plasmodium vivax malaria [Krintafel] to replace primaquine.